Export to Image for Excel instantly converts Excel documents into Jpeg, Jpg, Tiff, Bmp, Eps, or Ps files. Export to Image for Excel ensures that Excel files can be viewed by almost any imaging program, document management solution, or file viewer. Export to Image for Excel allows to create and send high-quality faxes using industry-standard resolutions. Export to Image for Excel is the fastest and easiest way to convert Excel XLS documents to professional-quality Jpeg/Jpg/Tiff/Bmp/Eps/Ps image file formats. 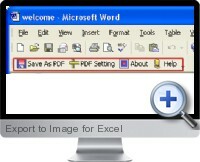 Its easy-to-use interface allows to create image files by simply clicking the "Save as Image" button from Excel, creating documents which can be viewed on any computer with a image viewer.